Unique and convenient mobile phone holder! So you’re driving at 120 miles per hour cause you’re late to office. And Your girlfriend’s calling. Your mobile phone is in your jacket pocket and you’re belted tight. Question – how do you pick up the call? Situations like these bombard you every now and then. You’ve got to stop cribbing and get prepared to face them head on! The Mobile Phone Wonder Holder does just that for you. 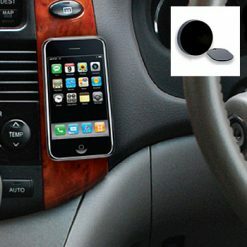 Using one of the simplest techniques around – magnets, these cool holders work like magic with not just your phone, but Sat Nav, iPod and remotes too. You can install the Mobile Phone Wonder Holder in less than a minute and enjoy hours of yapping while you’re setting the streets on fire. Stick the metal part to the back of your phone and the magnetic part to anywhere you want it on your dashboard, and voila! You’ve got yourself your Mobile Phone Wonder Holder all ready to rock (err, stick, we mean!). Product dimensions: 16 (H) x 10 (W) x 1 (D) cm / 6.2 (H) x 3.9 (W) x 0.393 (D) inches.